Circus acts with a variety of bicycles incorporated, from your typical bmx to a penny-farthing bicycle. After each show, I love to draw a scene that had an impact on me. In this case, it was a bit different. It was less of a scene and more of a person that impacted me. I couldn't take my eyes off of Blake Hicks. His blond hair mixed a bold blue, and his ability to exude a fearlessness, grabbed my attention. After a terribly long day at work, it was nice to have a show to look forward to. I made my way to the New Victory Theater, which was conveniently located less than a block from the train. I was seated on the Mezzanine floor overlooking the theater, and I was honestly excited. I love the circus. The music. The vintage costumes. The silliness. I was ready to sit back, relax, and enjoy the show. While children are adorable, silly balls of joy - I didn’t get those kids near me. I got the yelling for snacks, shrill voices, and nonsensical conversations kind of kids. I began to get annoyed, but I caught glimpses of cute moments. I couldn’t help but smile when a family did a group hug before sitting down or when a father kissed his son’s head lovingly. Fine - they won me over, and I was back in a good mood. The show started and I found it hard to focus with the whole ensemble performing on the stage. The first thing I noticed was their costumes. 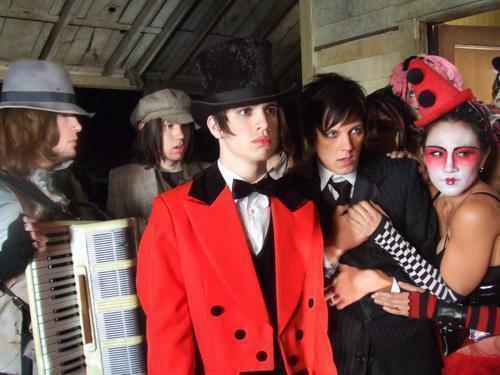 They had that vintage circus attire, full of stripes, corsets, and hats. The women looked like different versions of Harley Quinn and the guys looked like a variety of ring leaders. It reminded me of Panic! at the Disco’s “I Write Sins Not Tragedies,” which made me love it that much more. Then, I saw the penny farthing bicycle. Now, what is that exactly? Yeah. I had to google it to find the name out myself. It’s a bicycle with one big wheel in the front and a small wheel in the back. It’s huge in size and a major throwback. I would never ride it personally. I highly doubt I’d even be able to get to the seat with my height. The performer did a whole lot of spins and showed off his skills. Pretty fancy if you asked me. He had me by the mere fact that he was able to get onto the seat. With my love for the circus, in the back of my mind, I was searching for an act I could potentially do and during the first minute or two of the hulahooping act, I thought I had found my true calling. I quickly learned, however, that I was extremely underqualified in the minutes after. I don’t think I’d be able to contort my body or use the hulahoop, or multiple for that matter, like she did. She put her leg up and circled a hulahoop with her foot. Include the height of where she was performing and I automatically let go of the dream of being a part of the circus. You definitely won this round ma’am. I won’t be quitting my day job anytime soon. One of my favorite acts of the night was the unicycle act. They incorporated a romance between a man on a unicycle and a woman chasing after them. It was an act that was not only cute but also fun to watch. He did many of your typical unicycle tricks like jumping rope, but he did some cool tricks I’ve never seen before. Some tricks I was actually really jealous I wasn’t a part of. He gave the woman a piggy back ride while on the unicycle. I love piggy back rides, so that would just be infinitely cool. He even had her stand on his shoulders and even his head. His. HEAD. While that sounds super scary and I hate heights, I would definitely want to be a part of this act. Love plus cool tricks. Where do I sign up? Ever since the beginning of the show, one performer caught my eye. He was the janitor of the bike shop, and he also looked like the ultimate badass with the cutest smile. I later learned that his name was Blake Hicks and he had blond hair with a streak of dark blue. His outfit matched his hair, down to his shoes. A gold standard for me. He did a bunch of bmx tricks, and I was really taken aback. Maybe it’s the favoritism talking, but Blake was different in more ways than one, from the way he looked to what he did - I couldn’t help but pick him. There was an intermission, so I decided to read my playbill to pass the time. I began reading about the cast and the show itself. I found it interesting that the show had a backstory because I couldn’t seem to figure it out during the show. It was about an eccentric bike mechanic, who brings his works to life. A line that caught my eye in the playbill was, “where cycling is the only escape from a technology-obsessed society.” I couldn’t help but fall in love with that concept. I agree that we are a technology-obsessed society, and as ancient as this is about to sound, I remember the times before technology. I actually had a talk about this very topic with my aunt on our car ride back from Canada. We talked about the simpler times. The happier and easier times before technology took the world by storm. I love that they took something simple, like cycling, and chose it to be the escape or even possibly a remedy for addiction to technology. Pretty neat. This show kept finding new ways to impress me. There was an audience participation act, and I was so overwhelmed with joy when I saw that an adult was picked. At children’s shows, I’ve gotten so used to having an adorable child picked for an act, but no sir. Not this one. This one was an adult, and I just loved that. Sorry kids. Adults win this round because let’s be honest, adults are kids too, in their hearts. POST: 'Sylvia' - Sylviaaaaa! Come here girl! !